Acadia, Acadia, Acadia. Where to begin? This was BlueHour’s fifth trip to New England’s only major national park. And it’s always a great trip. This year, we made two visits - one at the very end of September, and one just the other weekend for the peak of the fall foliage. We had smaller groups this year, which enabled us to have more flexibility - always a good thing. Normally, our groups consist of couples, parent-child combos, and hobbyists on "solo getaways" from their spouses for the weekend. But this weekend was in particular a special treat for one of our students - an 18 year old who flew all the way from the midwest (alone) - who has never seen anything like the New England coast, the magnificent leaves, or even a lobster! It was our goal to make it all worth it. Naturally, it made sense to make a lunch stop at the famous Dysart’s Restaurant and Truck Stop in Bangor on our pilgrimage to Mount Desert Island. Yeah - it was good. After another hour or so of driving we pulled into our luxury hotel at the Blue Nose Inn. (Paul and I always joke about how this hotel is probably the fanciest place we will end up staying in on the business...considering we sleep in the car outside when we’re out scouting and cook on a mini stove under normal circumstances. And if you’re wondering - no, ‘real’ photographer’s don’t all get put up in fancy 5 star hotels and waltz out of bed to a hot breakfast and then go shooting; it’s hard work and waking up at ungodly hours to get the best shot! And after unpacking - we go right to shooting! We went to Jordan Pond for the sunset on night one, which always looks so different year to year. This is where you can see “The Bubbles” - the two round-shaped hills over the pond (some people refer to them as other things). After some time, we made our way into Bar Harbor for some dining at Geddy’s, and returned to our cozy hotel rooms to try and get as much sleep as possible before our first dawn shoot. And then - 4:30 AM creeps up fast. The alarm goes off and you know you’ve got to get up! Throw on your warmest clothes, and make it to the car. We make sure we bring along boxed breakfasts for everyone, and I always make sure to grab a hot coffee from the lobby before heading out. It’s the little things like a hot cup of Joe that make the morning more bearable. Sure, you’re groggy and cranky at first, but when we’re out on the rocks at Bass Harbor Lighthouse and the sun creeps up over the horizon, you don’t regret it. 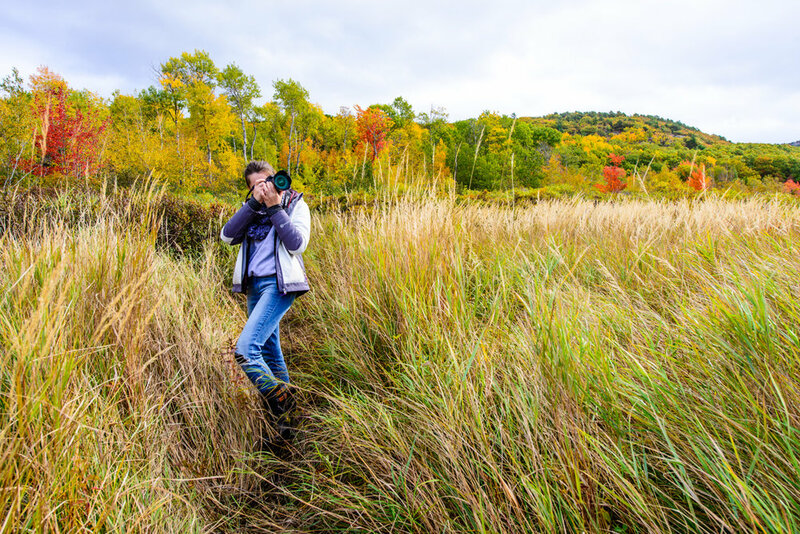 In fact, you might get some of the best photographs of New England you’ve ever made. It makes it all worth it. After an always-great shoot at Bass Harbor, we made a stop at Southwest Harbor to mosey around the docks. We were lucky to see the fishermen trail in, with their boats donned with lobster cages. This was an opportunity. A lobsterWOMAN - so rare! - let Maria, our student from the midwest get up close and personal with their morning catch. It was an unexpected treat that made the day. From here, we made our regular morning stop at Sips in downtown for hot chocolate, and headed to Somesville. We spent a good hour or so practicing composition at the Somesville bridge, and spent quite a lot of time around the Somesville cemetery - where there is a brook flowing over rocks and moss, and carrying colored leaves down its current. We had a lot of fun experimenting with the GoPro here! In Acadia, Paul and I always do a two-hour editing session to introduce our tour-goers to Lightroom and Photoshop, featuring a shot from the morning’s shoot at Bass Harbor. This time demonstrates the backend processes of photography that bring photographs to their ‘next level.’ We have little time to dilly-dally afterward, as make the drive out to Schoodic Peninsula for sunset. Schoodic is the most remote part of Acadia, and is actually detached from the rest of the park. You must make the drive out of Mount Desert Island and head east, and back toward the ocean to the peninsula. Here, the surf is violent and dangerous, and makes for great long exposure shots. But first - a quick stop at Raven’s Nest. Raven’s Nest is a unique cliffside outcropping that is surrounded by ocean on either side. It is hidden from view, and you may not know it was there at all had you not heard of it. Some photographer’s swear it’s a secret (I guess Google blew that one). We arrived to a few couples getting engaged at this spot, so as much as it was a ‘magical moment’ for them - it wasn’t that photographable for us. Still really cool and we did manage to get some video! At Schoodic, we got to see the sun set and the supermoon rise! Most decided to stay higher up on the rocks and shoot the reflecting pools, which is perfectly fine! But, word of warning: your instructors will venture closer out to the ocean, even with the tide coming in - we risk our lives for our shots. Just kidding...or am I? That leaves the last part of day two: Lobsters at Ruth & Wimpy’s! You bet we chowed down on some clam chowder and lobster, bibs and all. And, It was the perfect New England end to a great day of shooting for Maria! And dawn again. Who decided this was a good idea?? Oh, we did. Sunrise at Otter Cliff was incredible! Despite the other photographers who heckled us for ‘maybe’ being in their mediocre shots (mediocre because they aren’t on our tour!) our group had a blast. The sun and clouds were cooperating; the conditions were just right. The skies were pink and purple, and the ocean was crashing against the coastline. From dawn darkness to when the sun is high in the sky, the lighting here changes so much. Consistently I see that we’re the only group who stays to see it all. We grabbed a quick lunch and headed out to a new favorite for this trip: Jesup Path at The Wild Gardens of Acadia. This is something new for us. This location is a real New England-Autumn-forest-fantasy land. You can make some really intriguing compositions here, between the colored leaves and red ferns along the boardwalk to the expansive leaning birch groves. We find we have to tear people away here! There’s so much to explore, and we’re making it a permanent part of this tour. And with that, the weekend is over already! We make the return journey home, and wish our students well. We hope our students enjoyed themselves, learned something new, and made some beautiful photographs. We welcome you to venture with us again! And for our readers, we hope to see you too!